Our fire exits doors/emergency exit doors are manufactured to our heavy duty specification and are also available as single or double doors. 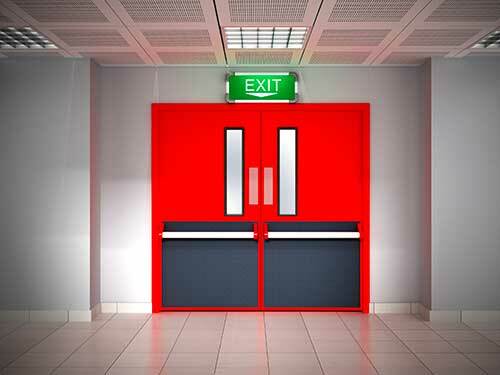 The emergency exits/ fire exit doors do not include an outside access device as standard; they are “blank” and it is the panic bar which keeps the door locked shut. The access device could be added as an accessory to allow the door to be gained the external side of the door. CE rated one, two or three point locking crash / panic bars for use on the inner door leaf, we can provide a pre installation fitting service for a small additional charge if required. As standard we supply the 2 point locking panic bar as it’s the most secure option available.